The christmas sets from K&C arrived today. In stock we now have G.I. Santa (XM009-01) and Mr. & Mrs. Claus having fun! (XM009-02). I know it is a little bit early to be thinking of Christmas, but it is only 7 weeks away. The dead line is fast approaching to order the first of John Jenkins Collectors Club Set #1. 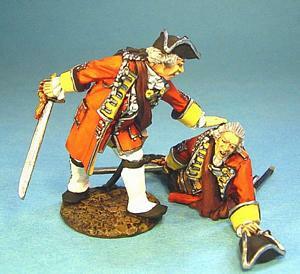 Colonel Sir Peter Halkett and Son. Three members of the Halkett family fought with Braddock at the Battle on the Monongahela. Two were never to return. Colonel Sir Peter Halkett commander of the 44th Regiment of foot, was attempting to rally his men when he was struck down by a musket shot. As Sir Peter fell to the ground his son Lieutenant James Halkett, also of the 44th Regiment rushed to his father’s side. He too was shot, and just as they had fought together, father and son died together. The pre-order period ends on October 31st. If you have not ordered it please do so now, so you do not miss out. Welcome to the Sierra Toy Blog! Our Blog commenced on October 26, 2009. We hope to to use this to keep you better informed about our hobby. We hope you will enjoy.